NFIP claims rise alongside upward trends in extreme storm frequency . . . The increasing frequency of US National Flood Insurance Program (NFIP) claims parallels the increasing frequency of extreme rainfall and flooding in the United States. The graphic above shows the number of NFIP claim losses paid for the top 15 years over 1979-2017. 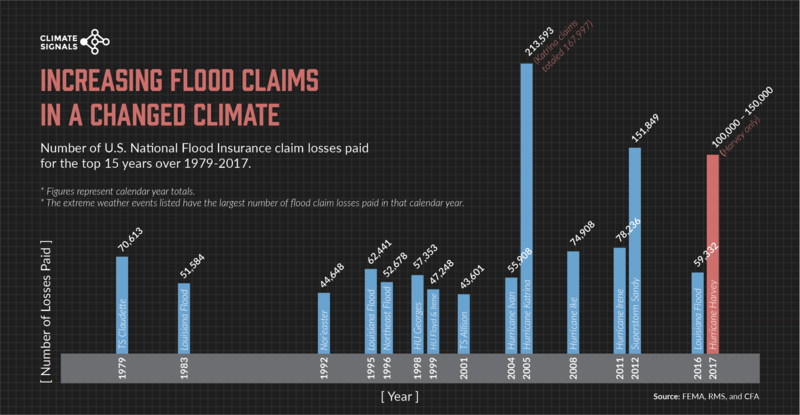 The data reveals an increasing trend in NFIP claims in the most recent decades, which is consistent with the increasing trend in extreme precipitation and heightened flood risk over this time. One of the clearest changes in weather globally is the increasing frequency of heavy rain. Climate change is fueling extreme rainfall and dramatically increasing rainfall across many types of storms. Over the past century, the US has witnessed a 20 percent increase in the amount of precipitation falling in the heaviest downpours. Nationwide in the US, there has been a 40 percent increase in the number of five-year rain events, extreme events that have only a 20 chance of occurring in any given year. Over the period from 1994–2008, extreme precipitation events linked to hurricanes accounted for more than 33 percent of the observed increase in heavy events across the US. Estimates of the increased rainfall have been calculated for individual hurricanes such as Katrina, and an increase in rainfall rates is one of the most confident predictions of the effects of climate change on tropical cyclones. The National Flood Insurance Program was almost $25 billion in debt with a $30 billion limit—before Hurricane Harvey. Recent calculations have revealed the sea level rise alone was responsible for 24 percent of the property damage incurred by Superstorm Sandy, as storm surge road rode much further inland due to elevated sea level. The rising number of NFIP claims, alongside the rising total dollar value of NFIP claims, also indicates the influence of climate change on losses separate from the influence of rising property values.